I love my Cricut especially when I can use it to make these adorable Reindeer Lollipop Holders in a matter of minutes. It’s Sunday Funday which means it’s time for some FUN! 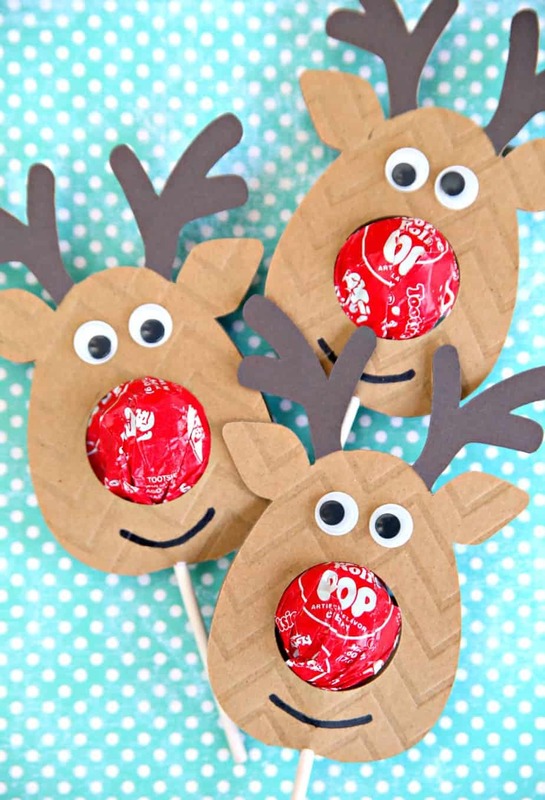 Today we’re going to be making the cutest Reindeer Lollipops. And, the best part is – they’re so easy to make thanks to my handy dandy Cricut. I also have exciting news. I’ve teamed up with a fabulous group of bloggers to bring you a new monthly Cricut crafting challenge. We’ll be sharing projects that we make with our Cricut. Woohoo! I love my Cricut and I can’t wait to share more Cricut projects with you. So, let’s get right to our first challenge. This month we’re all sharing a Christmas craft using our Cricut. After making my Santa Gift Box, I realized that I wasn’t using my Cricut to cut cardstock at all. I was so focused on using vinyl that I hadn’t even played around with cutting cardstock. Well, that has changed. I am now totally addicted to using up all the cardstock I had in my scrapbooking bin. Use your handy dandy Cricut to cut out Reindeers. Optional: Use the slice tool to slice antlers. 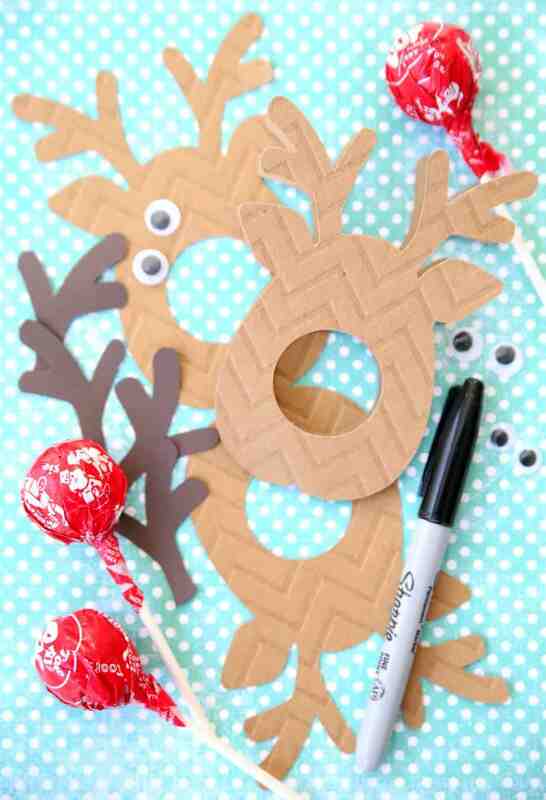 Adhere googly eyes and antlers using the glue dots. Draw on a smile using the black marker. 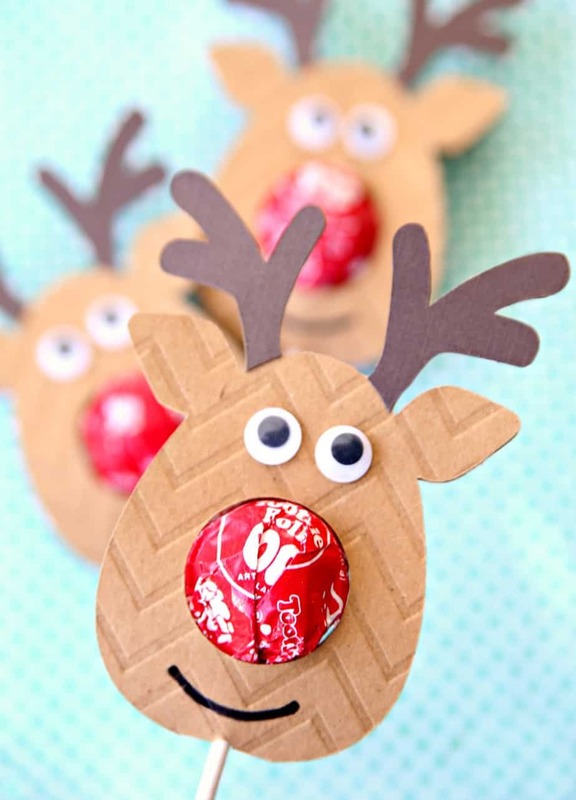 Add lollipop to center hole and fold reindeer around it. Use glue dots to adhere sides together. That’s it! I judst love the way these turned out. This project uses two of my favorite crafting tools – My Cricut and glue dots! I LOVE glue dots. They might be the best invention ever! Are you ready to get your craft on? Check out more Christmas Cricut projects and have fun crafting with your Cricut this month. What size did you cut the reindeer? After a bit of trial and error, I found the right size for Tootsie Pops to be 3.516 x 9.583.